Without a war or a large scale offensive from the AFP martial law in 2018 is going to be a bit boring. Under martial law the writ of habeas corpus is suspended which means anyone can be arrested at anytime for any cause. Mass arrests of suspected terrorists may result in some action and might even hamper the efforts of various groups to wage rebellion against the government but arrest is not as effective as death. 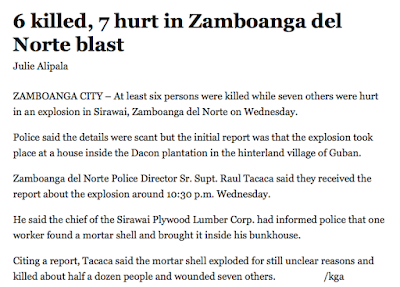 Right now it's the same old same old in Mindanao. 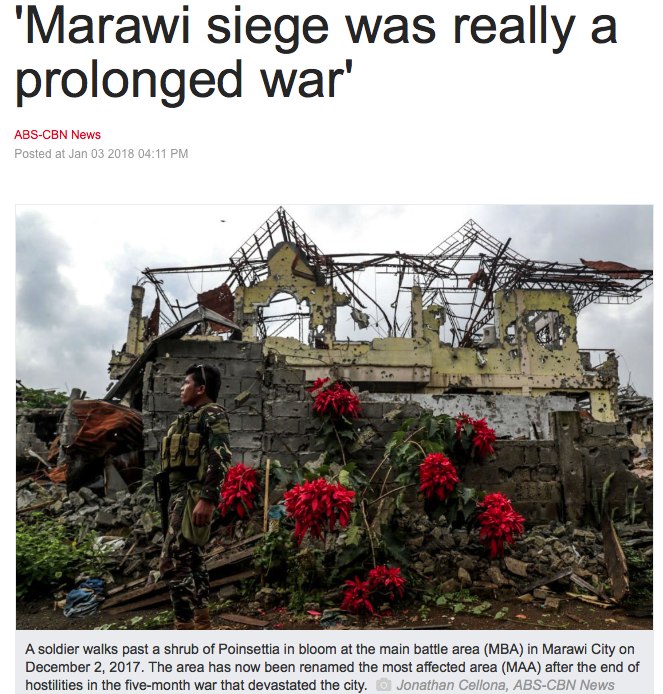 What is happening post-Marawi is what happened pre-Marawi. Bombs, shootings, beheadings, clan wars, rido killings, revenge killings. Nothing has changed. 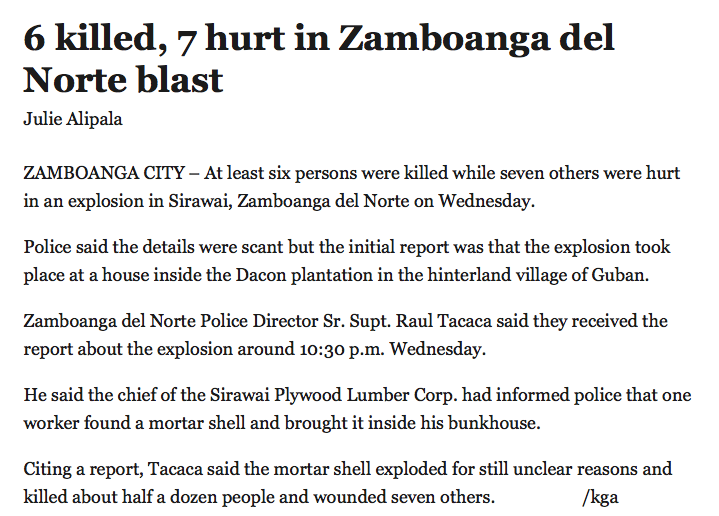 The ARMM is a violent hotbed of hotheads. 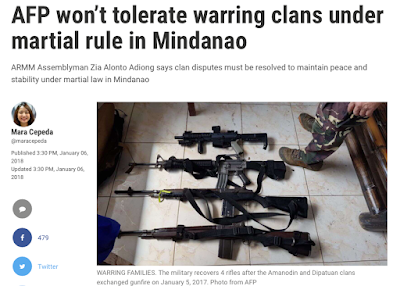 With martial law, however, these clan wars will NOT be tolerated. 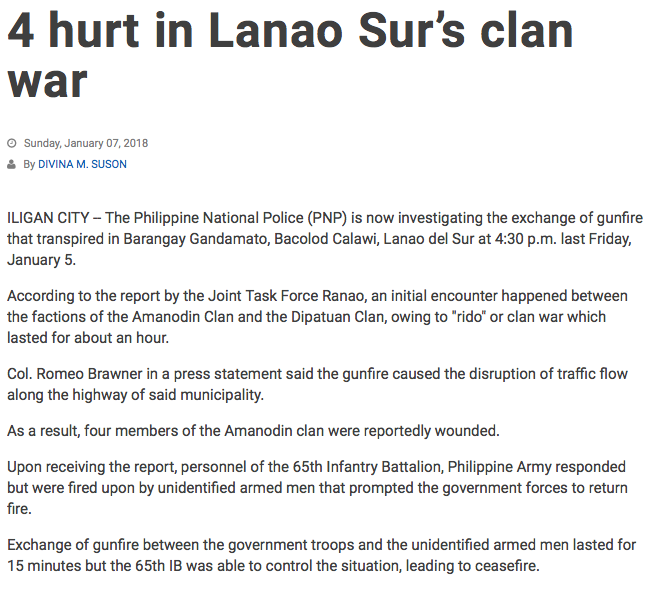 “The AFP will not tolerate incidents of rido and will continue to conduct law enforcement operarions in cooperation with the Philippine National Police, while martial law is in effect," said Major General Rosseler Murillo, chief of the 1st Infantry Division. According to Autonomous Region in Muslim Mindanao Assemblyman Zia Alonto Adiong, clan disputes must be resolved to maintain peace and stability as martial law continues to be implemented over the entire Mindanao. “We would advise our security sector to strengthen its partnership with the civilian authority by working closely on any peace resolution initiaves with the community leaders and LGUs (local government units) to appreciate the cultural dynamics involve in resolving ridos,” said Adiong. He said authorities must ensure loose firearms will not fall into the wrong hands and must stop the selling of unregistered firearms in the market. “The objective really is ending family disputes permanently, not simply to impose temporary ceasefire,” said Adiong. The cultural dynamics of rido killings? That is a fancy way of saying, "We are all Muslims and our religion permits us to be violent and carry out honour killings so please be sensitive to this fact as you try to stop us." Is the objective of martial law to end family disputes? 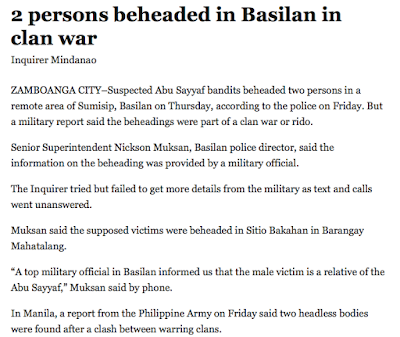 Does the AFP need to step in to quell the violence of the Filipino Hatfields and McCoys? 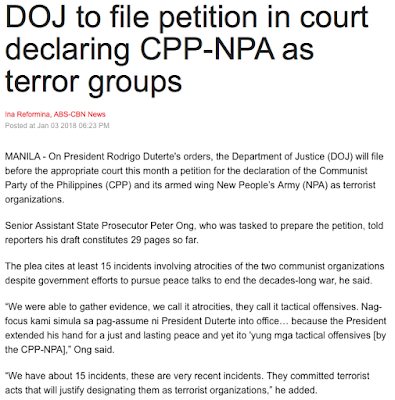 Perhaps but why would martial law be needed to send a few troops to end the violence? These incidents of rido have been occurring for a long time. Why was the AFP tolerating them then? Why is the ARMM wanting to resolve these disputes now? Why have these bloody feuds been allowed to continue for years? Why does this Assemblyman not appeal to his violent fellow Muslims for peace but instead warns the AFP to appreciate the cultural dynamics of these killings? 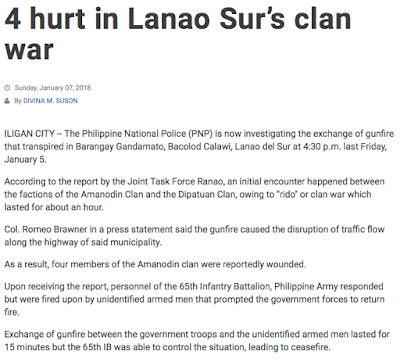 It's because the governors of the ARMM are not interested in peace as we know it, which means a total cessation of violence, and these appeals for peace are all for show. For them peace means the death of their enemies. It's a Muslim world down there and as soon as the BBL is passed they will have even more autonomy to rule as an independent Muslim state. Adiong said it was only later on in the crisis when local officials began to realize how radical ideologies have been quietly spreading across Mindanao, and lamented how little has been done to counter such narratives. "They (terrorists) have been using experiences of inequality as a common experience among different Muslim countries across the world [in recruiting]," he said, noting that the Maute group had been searching for members as early as 2011. Asked on his views on what went wrong in terms of security, Adiong said it is better to focus instead on rebuilding Marawi City rather than point fingers. "We cannot dwell on the past. Let's move forward. This is a big lesson for our country," he said. "Our focus right now is moving forward. It has already happened, the destruction is already there. We really have to channel our energy towards the rehabilitation of Marawi," he added. These comments are from the same ARMM Assemblyman who said the AFP should appreciate the cultural dynamics of rido killings. He says that radical ideologies have quietly spread across Mindanao and officials lamented how little had been done to counter these ideologies. This is contradicted by his next statement where he acknowledges that Maute had been recruiting since 2011. 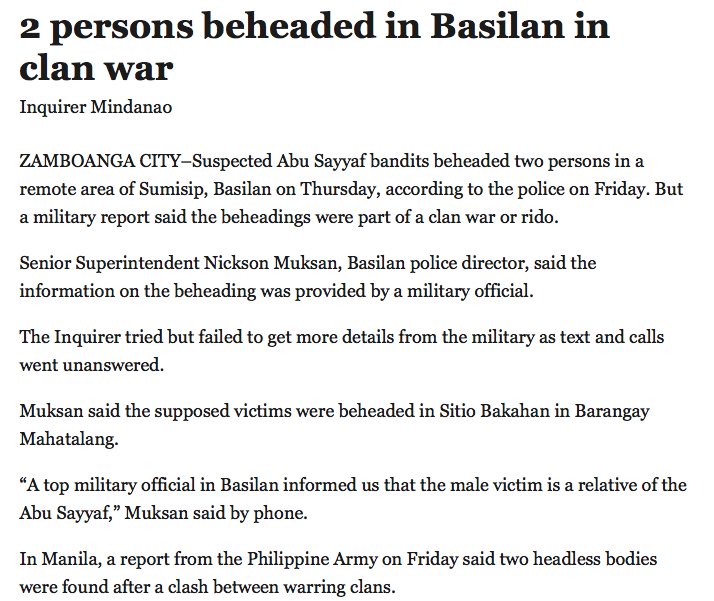 We also know that ISIS had been in Mindanao since at least 2014. This is 6 years to counter Maute and 3 years to combat ISIS from spreading. So why was nothing done? What happened that radical ideologies were allowed to spread and recruitment was allowed to happen? 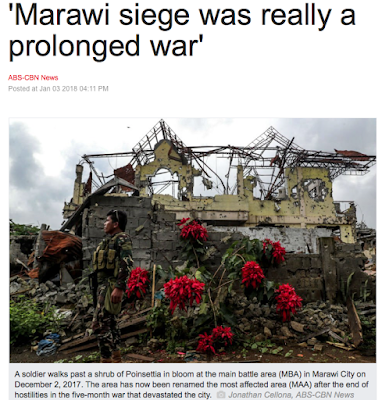 And more importantly what happened that a large scale attack like Marawi was able to occur? Adiong, much like SolGen Lorenzana, does not care what happened. Let's not dwell on the past. Let's move forward. Let's not learn from our mistakes. Or rather let's learn from our mistakes without actually learning what those mistakes were! Take note that he says, "This is a big lesson for our country." Well what's the lesson? If we do not look to the past and investigate what went wrong then the country will never learn any lesson. Does this guy know how history works? Does he even believe in history or only an eternal now which is unfettered to the past? 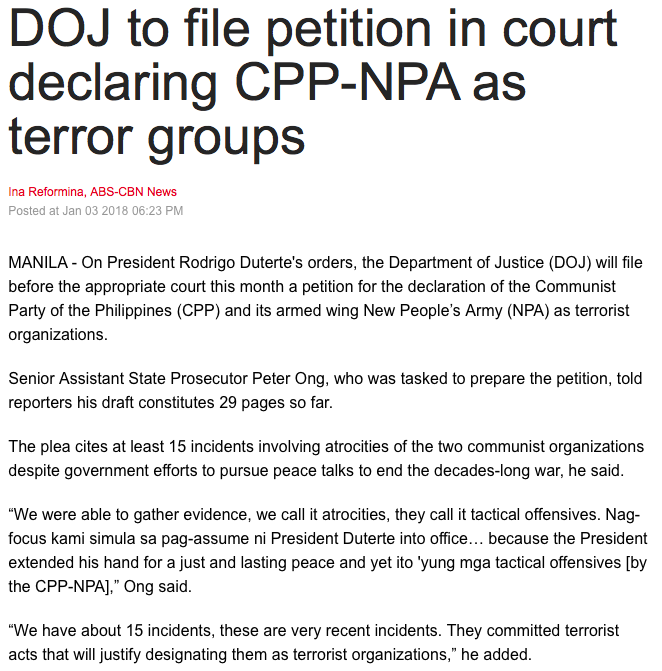 I began this article by stating that a large scale offensive is going to be needed to make the most of martial law. It might be coming. The military on Tuesday urged communist rebels to surrender or face a full-scale offensive after the two sides terminated their separate unilateral ceasefires for the Christmas and New Year holidays. Toribio said government forces in the Southern Tagalog and Bicol regions would launch all-out counterinsurgency operations to crush the NPA after the end of the truce at midnight on Tuesday. Either these all-out counter insurgency operations have not been launched or the media has been very lax in their reporting. 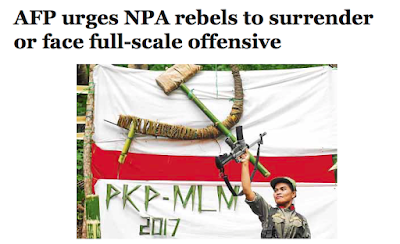 It could be that such an operation cannot yet be launched because despite Duterte's order declaring the CPP-NPA as terrorists the DOJ must still approve this label. Red tape is delaying the war against the Reds. It's like poetry. 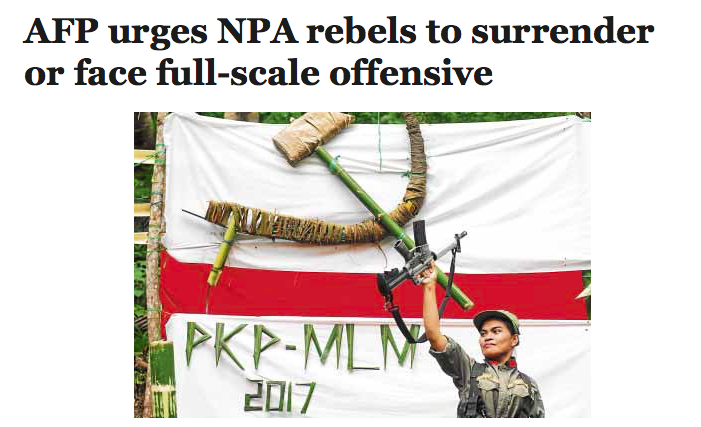 An official declaration of the CPP-NPA as terrorists will allow the government to wiretap them and freeze their assets. Because the communists have been at war with the government since the 60's I would assume such a declaration would not give the AFP any powers it does not have currently. Like launching a full-scale offensive against these rebel scum.